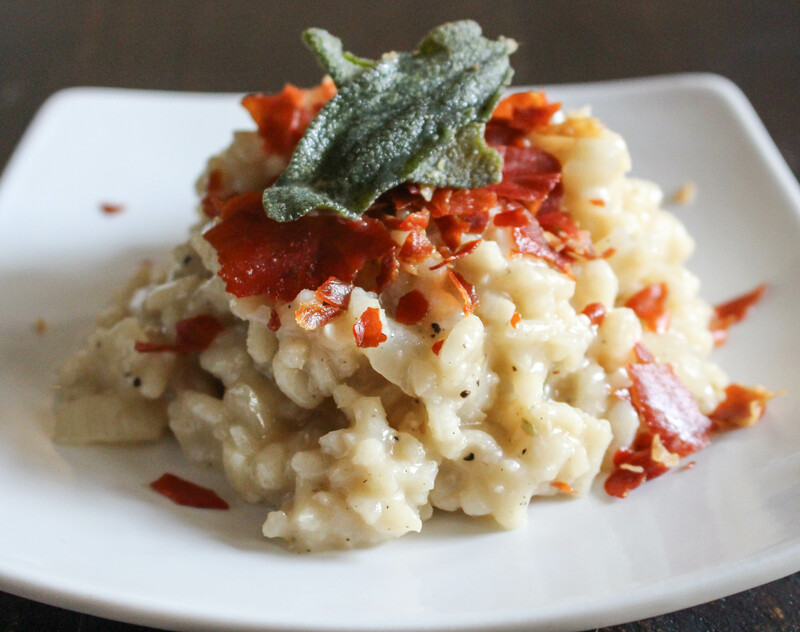 I can’t believe it’s taken me this long to share a recipe for risotto. I’m in L-O-V-E with the stuff. I also can’t believe we’re more than halfway through January already! What is happening!?! Time is FAH-LYING by these days. I don’t like it. Not one bit. I mean, I am not the biggest fan of January, generally speaking. As I’ve mentioned in past posts, it’s just a dreary, dull month full of post-holiday gloom. So I’m happy that it isn’t dragging on…but jeez! I can’t believe Christmas was already 3.5 weeks ago! What the what! I can blame this mostly on work. It has been a whirlwind lately, which is wonderful in some ways and a curse in others. The workweeks have been flying by, which is great, but before I can catch my breath – it’s Friday again! I know, I know. Who complains about it being Friday?! I guess I just feel like time is going too fast, and I don’t have time to process it. It’s overwhelming. At least this weekend is a three-day one for me. Maybe that will help. It’s perfect for when you need some rejuvenation (or soothing because you are getting old and time is going by too fast. Ahem). Risotto is one of my most favorite things to eat and make. It’s a default for me when I get in a cooking rut. It’s warm, creamy, and comforting and can be customized to your tastes/desires in countless ways. Plus, people tend to think it’s impressive…but…shh…it’s actually pretty easy to make! It takes some patience (not one of my strong suits), but the technique is pretty straightforward. And the result is totally delectable. 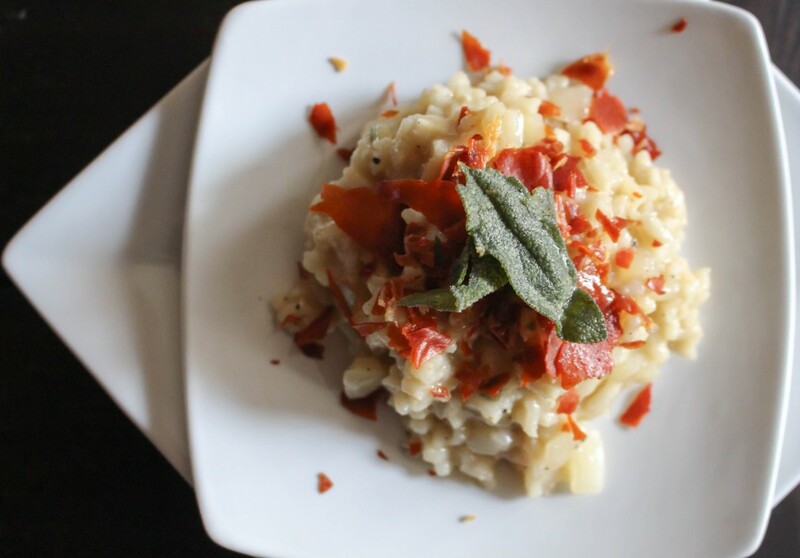 This rendition has the sweetness of pears, the saltiness of prosciutto, and the warmth of sage. It’s incredibly complex in flavor…but simple at the same time. These flavors just GO together. The key to making great risotto is to keep it simple. Pick ingredients that pair together nicely. And put on your Patience Pants. Seriously. Mine always seem to be dirty in the hamper….or just flat-out missing. But they are a requirement when making risotto. Sigh. Start by sautéing onion/garlic/shallot/etc. in butter. Add your rice (short-grain rice is best) and allow it to toast for a bit. Add some wine. And then slowly (SLOOOOOOWWWWLLLYYYY) add WARM chicken or veggie broth to the pot. Let it incorporate and then add more. Keep going until the rice is soft and the mixture is thickened and creamy. Grate in some cheese, throw in whatever else your heart desires, and voilà! You’ve got risotto. See? It’s not that complicated. Just takes some time. Hence the Patience Pants. Now, if you’ll excuse me, I’m going to go reheat a bowl of this for breakfast. Yes. Breakfast…followed by a full day of medical editing. At least it’s Friday. Again. 1. Preheat oven to 375°F. Line a baking sheet with parchment paper or foil. Lay the slices of prosciutto flat on the sheet. Bake for about 15 minutes or until the prosciutto is beginning to crisp. Remove from oven. The prosciutto will continue to crisp as it cools. Break up the crispy prosciutto with your hands and reserve. 2. Meanwhile, heat the oil and butter together in a pot or deep-sided skillet over medium heat. Add the whole sages leaves and cook until fragrant and crisp, about 2-3 minutes. Remove from pot and reserve. 3. To the same pot, add the onion and cook for 5-7 minutes, or until soft and translucent. Add the garlic, chopped sage, and rice. Stir to coat the rice in the oil and cook for 1-2 minutes. Add the wine and cook until mostly absorbed. Add in the pears and sugar. It’s also a good time to add a hefty pinch each of salt and pepper. 4. Add ⅓ cup of the warm broth and stir to combine. Reduce the heat to medium-low. Stirring frequently, cook the rice mixture, gradually adding the broth in ⅓-cup increments until all the broth has been absorbed. The risotto is ready when the grains of rice have puffed and softened and most of the liquid has been incorporated. The entire process will take roughly 20-25 minutes. 5. During the last few minutes of cooking, stir in the parmesan cheese. 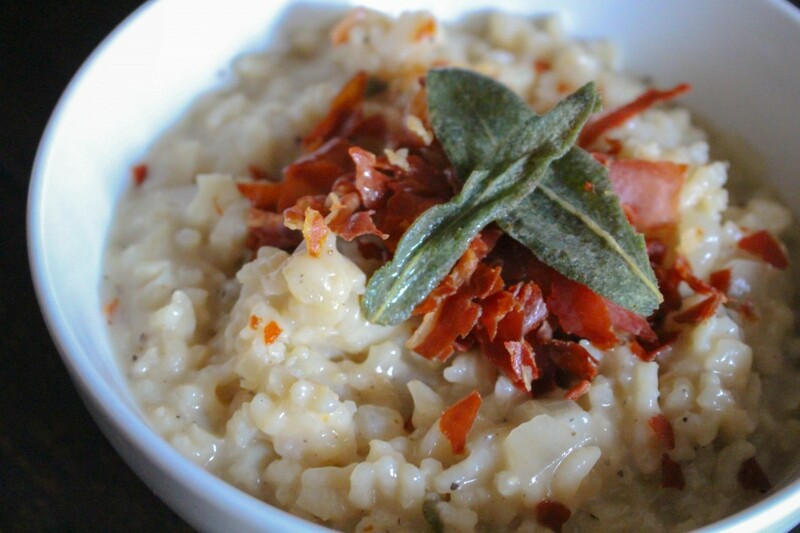 Serve the risotto garnished with the fried whole sage leaves and crumbled crispy prosciutto. Love all the great recipes!!! what a unique risotto dish!! 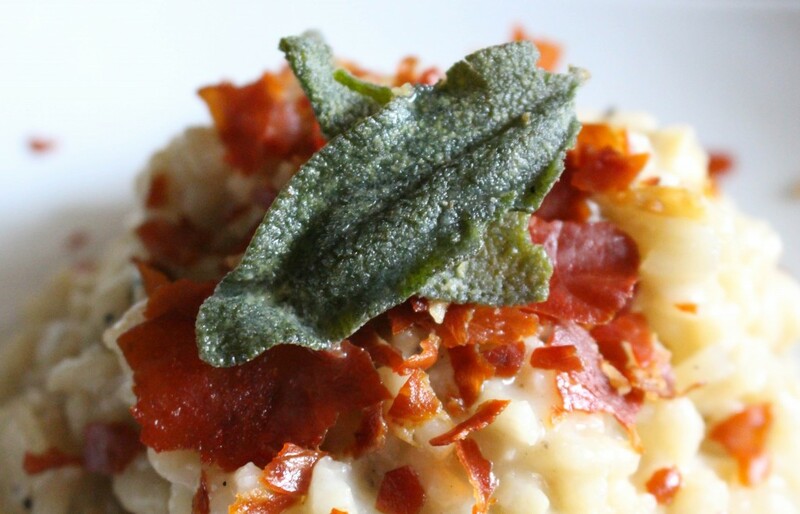 can’t go wrong with crispy prosciutto and fried sage, that’s for sure! Hi Molly! Omg, you are like… My twin! A mother to two lovely fur balls and wife to a wonderful man :). The second darkest place in my life right now (next to my poor baby with a broken heart), is that as much as I loooooooooooooooove eggs, I’m actually found out I was egg intolerant two years ago… Yes, there’s such a thing. Maybe from eating at least 3 eggs a day for far too long… So now, I lick them. Yes. Just a few little licks of those beautiful eggs you have here, and that’s it. So I guess I just wanna say, hi twin, please enjoy those yolks for me. Omg I just did an arm flail. I love your blog…I’m a huge fan so this feels like a big deal 🙂 thank you for stopping by! I’m definitely thinking of you and your hubs right now…Dogs are simply the best. Oh and bummer about the egg allergy! I don’t know what I would do! You still manage to create some pretty amazing stuff! Oh dear I am now STARVING! 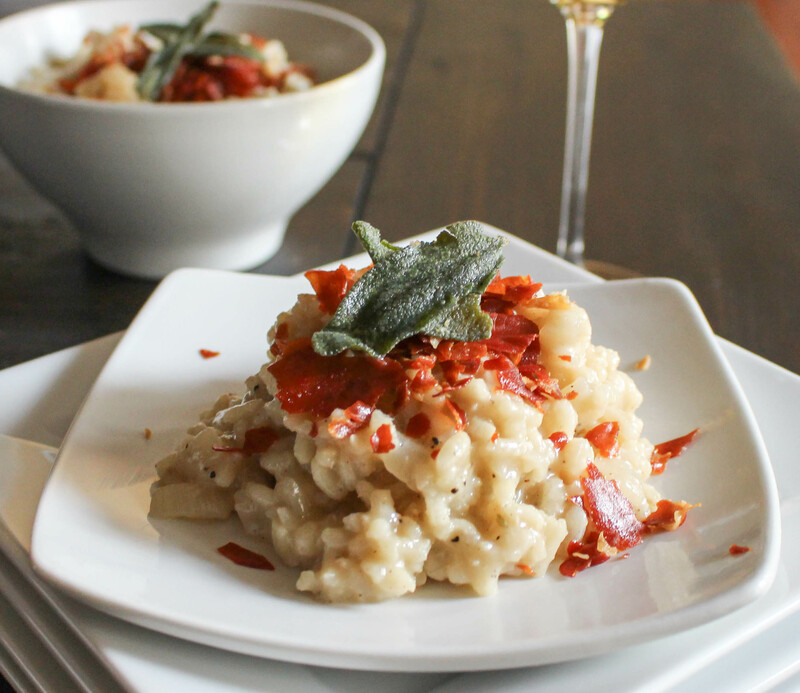 I am a foodie and always and enjoy risotto at restaurants but haven’t attempted it myself. I’m going to try now! This looks amazing! Lovely recipe! 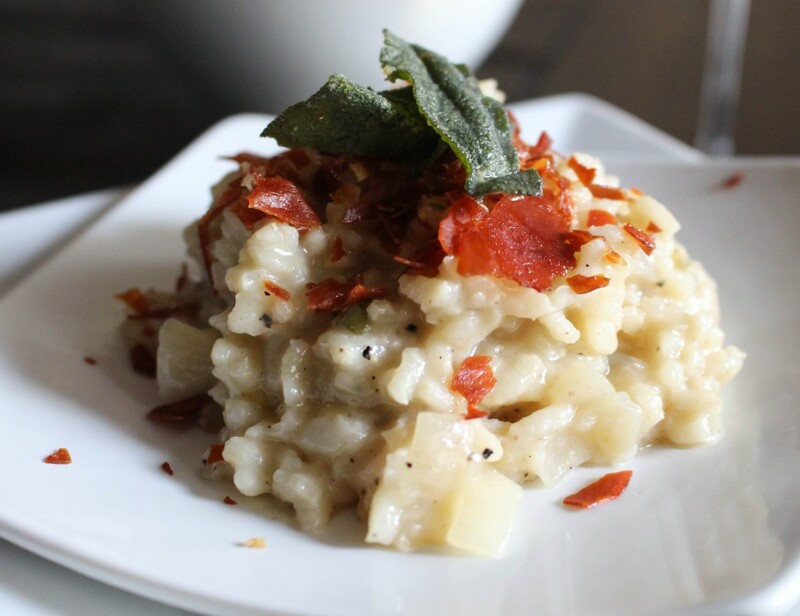 I absolutely love pear risotto and you got lovely recipe for it! I am surely going to try this ! Great flavor combinations – Love your blog too. Thank you, Medha! Let me know how it turns out for you if you try it. Thanks, Lindsey! That pizza looks fantastic!